Recruitment tests for pilots and air traffic controllers are modular by design. During the first stages of selection, applicants undergo computer-based screening tests to examine their operational and cognitive skills. However, it is ultimately the psychological interview towards the end of the selection process that decides whether a candidate is hired or not. 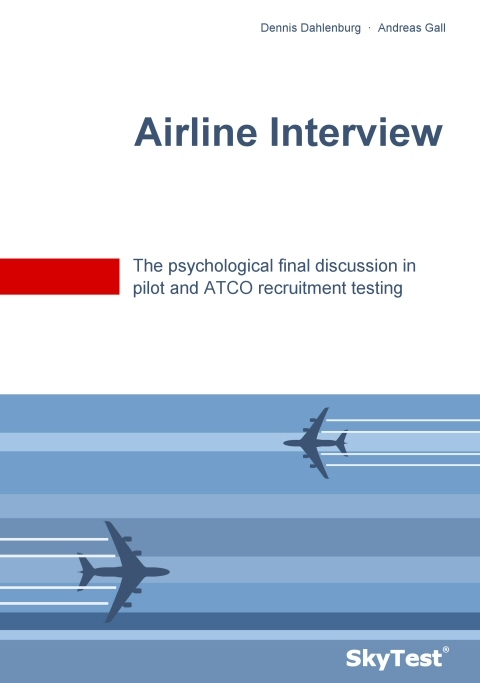 SkyTest® Airline Interview presents the theory and methodology of the interview approach used in modern suitability testing for pilot selection processes. The book uses concise explanations and plenty of examples, as well as biographical and situational sections of the interview from the perspectives of both the interviewer and the applicant. The interview is a game played against itself. Applicants can be trained how to interpret the questions based on the objectives of the interview and subsequently develop answers reflecting this. SkyTest® Airline Interview accompanies you throughout your preparation for this important part of the selection process and provides helpful hints, while a comprehensive catalogue of practice questions allows for direct application. If you would like to practise a complete airline interview, allow us to refer you to SkyTest Airline Interview - The Exercise Book (ISBN: 9783744822541). This book uses practical tasks to show you how to master both expected and surprising interview questions.